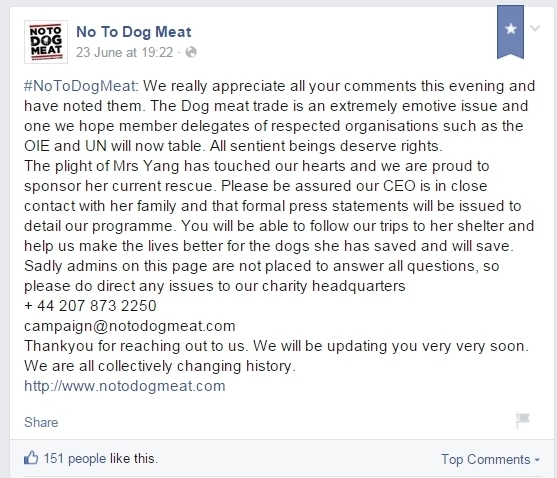 In July of this year, former ‘No To Dog Meat’ volunteer Sophie Ling visited Mrs Yang in China for the second time. During these visits Sophie worked hard to gain Mrs Yang’s trust. Not an easy task when dealing with a lady who has spent years facing corrupt officials, intimidating dog meat traders, and broken promises. At the time of Sophie’s visit Mrs Yang was finally ready to talk candidly and share more information about the animals she has rescued. She agreed to being interviewed by Sophie, an audio recording of which is posted below. Mrs Yang was aware, and in agreement to, her own “website” page which Sophie would update with news from China. 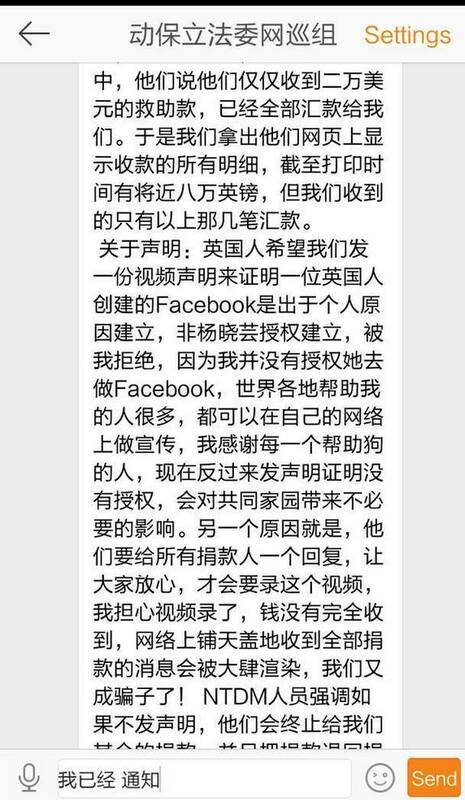 The “website” referred to was the “Mrs Yang Official” facebook page. Mrs Yang stated that the most important thing at that time was relocating to a new shelter. She requested that the money raised by the NTDM fundraiser be used to secure a new shelter that would house all the animals in her care. Mrs Yang stated that she did not, at this time, have sufficient food for all of the dogs in her care and this was an immediate concern. Mrs Yang was in agreement of setting up a management group of trusted people who could support her in taking forward a program of change to improve the lives of the animals in her care. Mrs Yang stated that she wanted Sophie Ling to be her representative when dealing with NTDM. It was very clear from information coming out of China before the fundraiser was started that Mrs Yang was in a dire situation. Her animals were suffering from insufficient food, ineffective management, limited medical treatment, overcrowding and unsuitable housing. 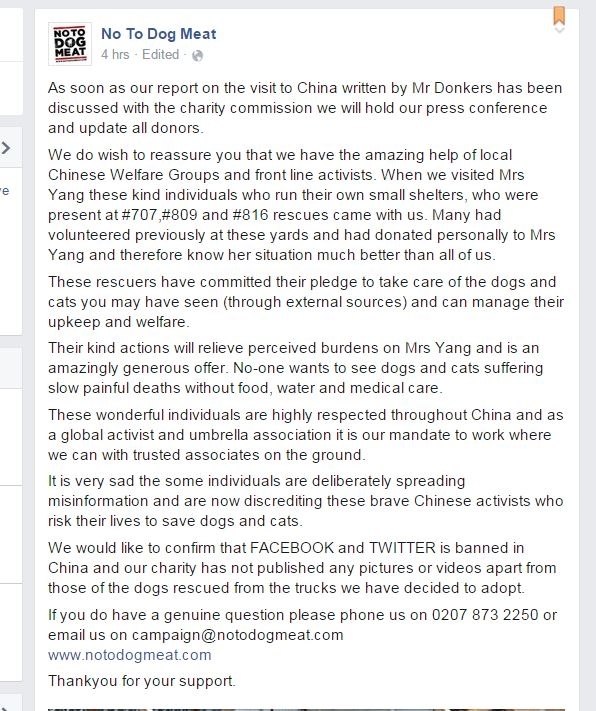 Have Mrs Yang’s dogs been rehoused in more suitable accommodation where their living conditions are improved? Have the dogs been provided with the medical supplies and food that were so desperately needed? Have the dreams of a vulnerable elderly woman struggling to cope been realised? We don’t think we need to tell you that the answer to these questions is a loud and resounding NO! NTDM were in the perfect position to make a real difference to the lives of both Mrs Yang and the animals in her care, and what have they done? Dashed her hopes and dreams and left animals to suffer in squalor. 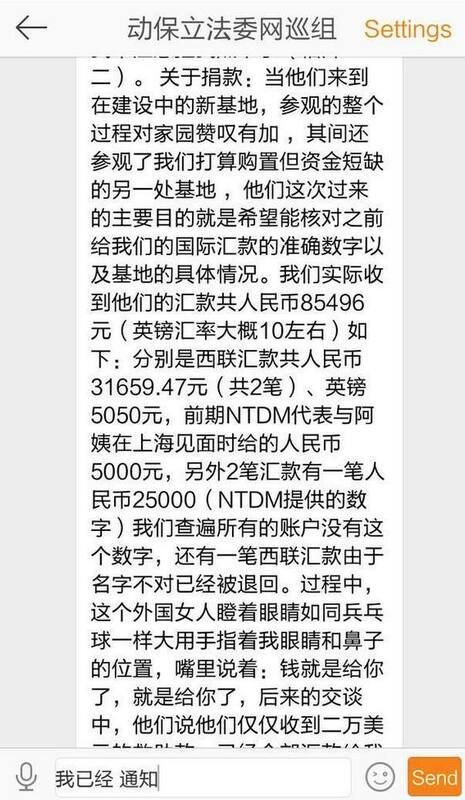 Because of the inaction of NTDM Mrs Yang’s dogs are still hungry, still overcrowded, still suffering. The charity MUST be held accountable for their lack of support for Mrs Yang over the last two months and the suffering of so many animals. They have sat on the pot of gold, and continue to sit on it while the dogs continue to suffer. 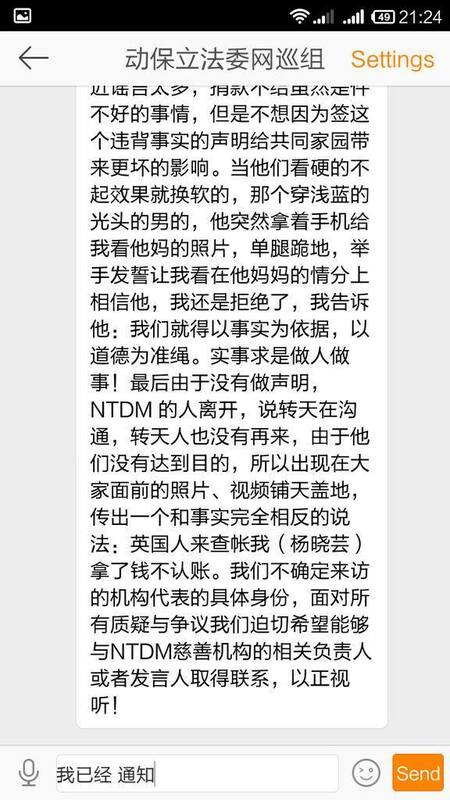 During Sophie’s interview Mrs Yang said that she was afraid of NTDM, afraid that they wouldn’t give her the money. It looks like her worst fears may well be realised. Please listen to the audio yourself and read the statement from Sophie Ling as posted on what was “Mrs Yang Official” Facebook page. Video recorded 19 July 2015. It is with real sadness that this page original objectives have been lost. Mrs Yang agreed/asked me to set-up her Facebook page during my second meeting with her on July 18/19. I have several videos and recordings that testify to this but these will not be shared, as I do not want to upset her further. I am publishing this this voice recoding only as Mrs Yang gave a clear picture of the situation and her needs. I returned from China in July excited that this would be a new start; Mrs Yang was prepared to start talking and share more information. We agreed I would share the information I had gathered and she would start to provide me regular content. This I believed would help highlight her challenges and invite people and organisations to provide her with long-term help. Out of respect to Mrs Yang, I have now changed the name of this page to ‘Mrs Yang, visit 2015’. 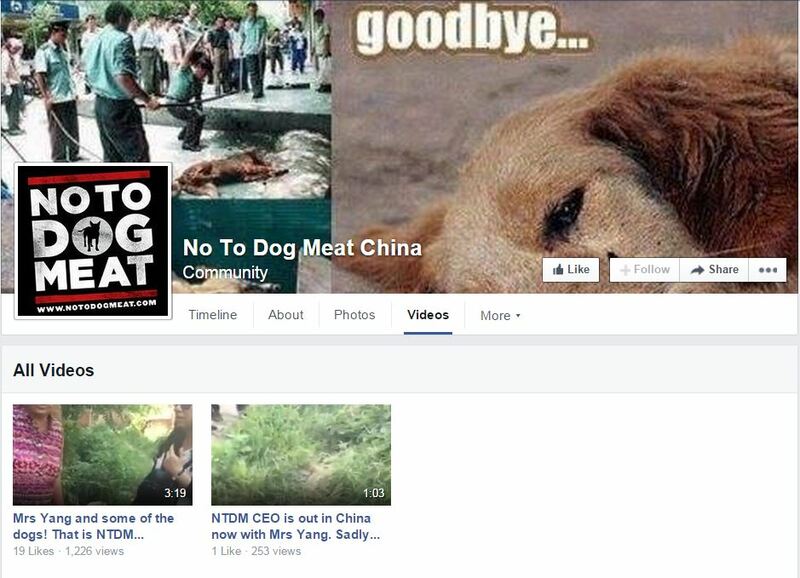 I appreciate many of you will no longer wish to follow this page but I want to keep the situation documented, as I believe it contains an important set of lessons in relation to the cat and dog meat trade in China. I have restrained from speaking for myself on this page, as I wanted to protect the legitimacy of Mrs Yang’s voice. This post does not represent Mrs Yangs views; just my own. I have met Mrs Yang twice; both times have been filled with respect and affection. We parted each visit with and exchange of gifts and hugs. 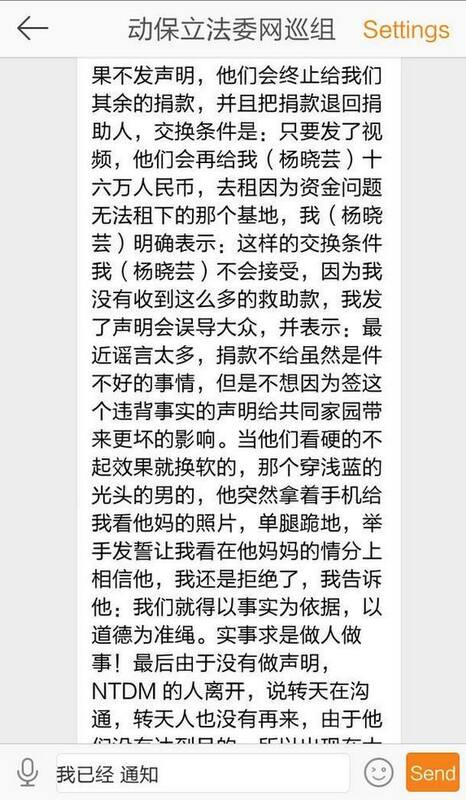 I know Mrs Yang did not always tell me the whole truth; why would she trust a stranger after years of broken promises? I do not agree with attacking someone in crisis; they should be firstly made to feel safe by offering unconditional help; then and only then can one start to create ‘rules’. This page showed the conditions; insufficient food, ineffective management, limited medical treatment, no animal grooming, unfit-for-purpose series of rented farm pens and sheds… Her request was clear, help her stabilise the locations and then a program of change can begin. Getting the animals out of the pound/scattered and temporary locations would have been the building block for the future. Mrs Yang is a woman without a professional team of support and a track record of rejecting external involvement. The page was solely intended to share facts and slowly build her trust in order to coax Mrs Yang into a sense of security where she would be willing to collaborate. I do believe she has been told to say she did not give permission for this page. What has happened to Mrs Yang over the last two weeks is nothing short of wicked. We discovered nothing new, an elderly lady who is overwhelmed by her ‘compulsion’ to rescue dogs/cats from the meat traders. 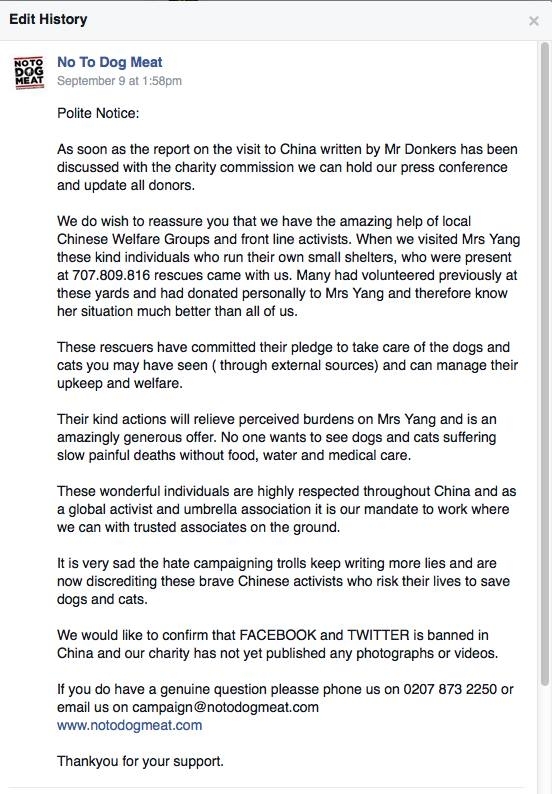 My visit and this page was (is) a genuine attempt to help highlight the issues and encourage change for both Mrs Yang and the animals. Mrs Yang is a very controversial character in China; she has many practices that are not helpful to the cause (e.g. reputation of buying dogs from traders; refusal for external intervention…). Mrs Yang understands the power of her voice and her silence; but she is still an elderly woman. The animals remain at the mercy of these politics. Yes, she is wrong to not collaborate with the global charities whom I am assured have offered help over several years, she is wrong to not cooperate with the ‘policy’ to not buy dogs (this undermines the efforts of the entire roadside rescue groups who rely on negotiation using the basic legal framework of ‘thief’ and ‘danger to public health’ in the absence of animal rights). She is also clearly mistaken to keep accepting dogs when she is unable to provide the right environment. But isn’t that reason enough to help?! When I first met Mrs Yang, in June, I was volunteering for a UK registered charity. Their contact asked me to meet her on one of my trips to China (privately funded/self-organised). As soon as I did (3 week before Yulin), all I could think of offering was a fundraiser. This page was never intended to be about that project only! But it has now become the focal point. I guess that part of the story is a good example of how things can go wrong. I’ve learnt many lessons, do not give your time to a charity unless you have fully established their credentials; do not run into a situation without asking yourself why had the global/Asian organisation not stepped in before? Build relationships and do not accept face value. Knowing Yulin was fast approaching I ran to try and beat the clock; simply focused on ‘save as many dogs as possible’. After one hour with Mrs Yang I guilelessly dived-in; I reacted from my heart and set about promoting the fundraiser on any/all social media channels I could manage. I never imagined so much attention would come her way and the donations increased beyond all expectations. Within days of the fundraiser surpassing it’s target 5-fold I resigned from the UK Charity. I still thought I could stay involved to help tell her story and expedite the information needed for the charity e.g. what money she had received and how it was being spent; agree how the remainder should be spent. I offered to play the role of facilitator, feeling a morale obligation to help ensure they donations were received and spent wisely. That was rejected and controversy has prevailed. I am ashamed of my foolishness and saddened I could not make it work. I, along with others have been subjected to weeks of abuse and threats; it has been disgusting, intimidating and downright enraging. Tying to tackle the malicious rumours about this page has become a waste of time. This page was supposed to focus on Mrs Yang; it invited anyone to updated/share information and thanked the other group that provided a donation. I would like to thank all the people that have been bold enough to challenge the abusers and protect the truth. Equally I am privileged to still have trust with some Chinese animal activists, who have kept me informed. To the page commentators, I am so sorry you have endured continuous mistreatment. I am sorry for your frustration with me not speaking up and sharing the insider view; I hoped time would resolve matters. I hope this post will demonstrate my gratitude and provide you with resolution to your questions. I will continue to work with the relevant authorities to address the crimes. No doubt by simply speaking the abuse will once again escalate. Please if you experience this, keep the evidence and contact the police. I cannot/will not use this page to air my personal complaints again. I have just less than two years experience in relation to the dog/cat meat trade. During that time I have visited China almost every 8/9 weeks. I have visited shelters, networked across the north-south western Chinese dog/cat meat activist route. I have taken part in 1 cat rescue and 1 attempted rescue. Yep I am a naïve, over optimistic fool, but I still believe in the power of the individual to contribute; we must not feel disempowered by the descending, cruel and conflicting voices. 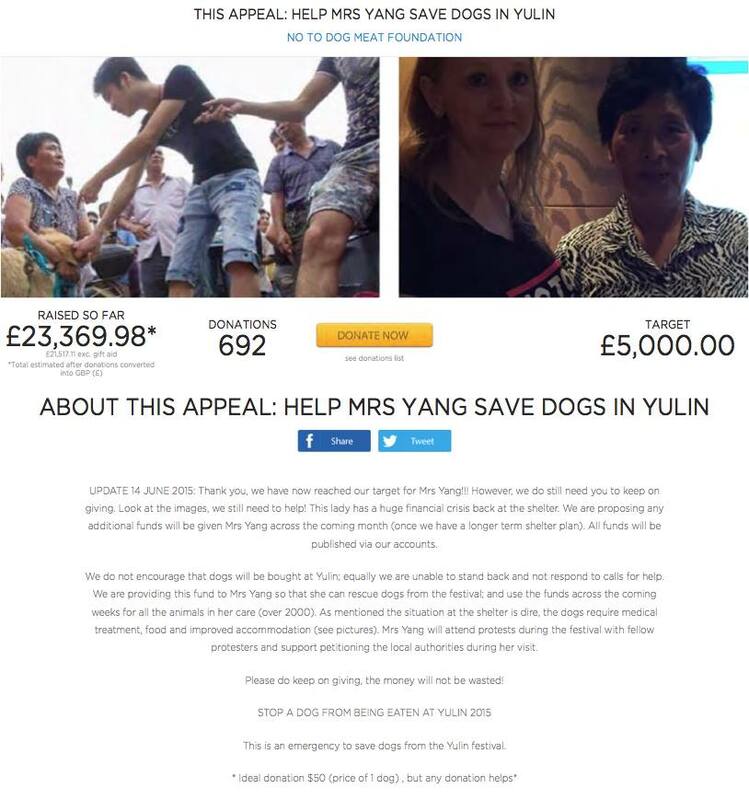 We need now to accept that the Mrs Yang challenge requires a combined effort from the global animal welfare community; that is how I will support Mrs Yang. I urge you to work with the Global and Asian animal charities who have the skills, infrastructure and integrity to make a real difference. I absolutely understand why Mrs Yang has now said she did not give permission to this page. Regardless the focus for the future must remain safeguarding the animals and giving Mrs Yang a dignified role/retirement and recognise her role for highlighting the evil cat and dog meat trade to the world. My hope for her is that she will be able to step-back and coach a new generation to take-up her mantel. Lets keep the dream alive of a professional shelter, where the animals are homed, fed, treated, taught to play combined with an societal change towards dogs and cats as sentient beings, our dearest companions. I’m still hope to be able to adopt both within and outside of China. I am sorry you have had to witness such conflict. 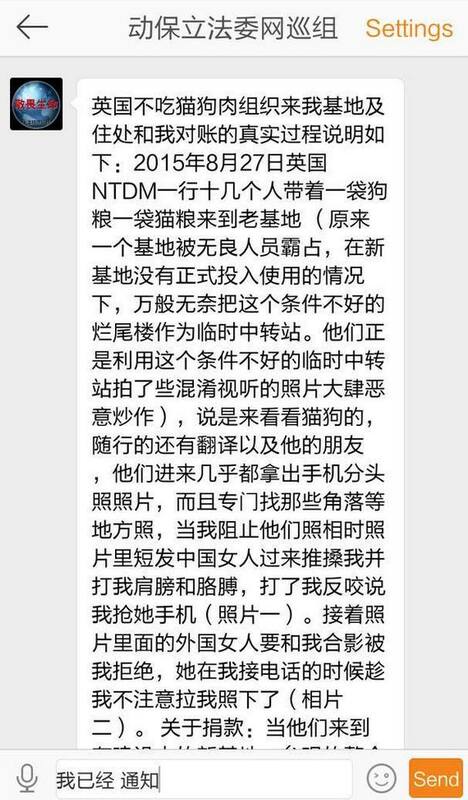 The other admin has now backed out, as have many people who do not want to be abused/are unhappy with Mrs Yang. So, simply treat this now as my page, stay, go…but please do not forget the animals are still lying in filth, vulnerable to being stolen by the traders/sold by corrupt pound guards and a woman that is angry/defiant due to fear. I pray she will be offered and accept help. This page only represent my personal experience with Mrs Yang and not the wider Mrs Yang projects; so is no longer her official Facebook page. 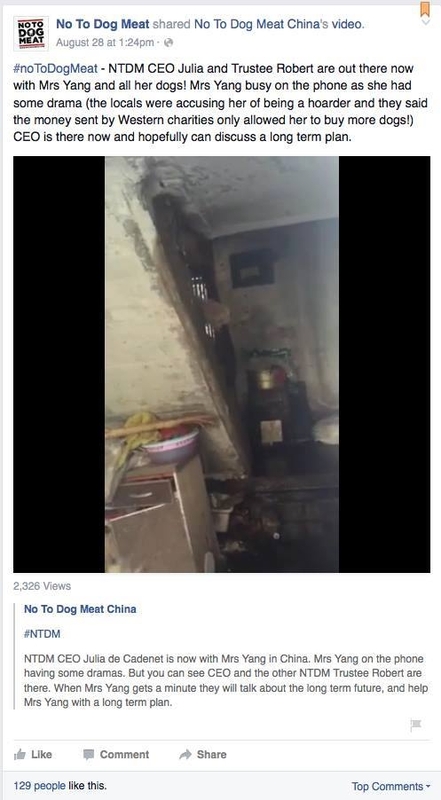 An online petition Ensure MRS YANG receives ALL DONATIONS given for her and INVESTIGATE the UK registered charity # 1154524 ‘WORLD PROTECTION FOR DOGS AND CATS IN THE MEAT TRADE’ (WPDCMT) AKA ‘No To Dog Meat’ (NTDM) is currently running at 4,800 signatures.